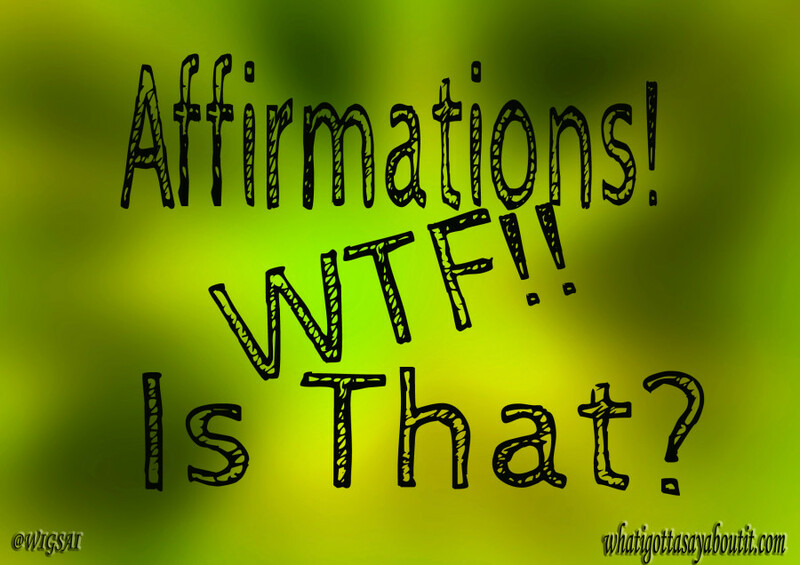 I’ve posted a lot of affirmations lately and I thought I should explain what affirmations actually are. Simply put, affirmations are short, powerful statements that describe a desired situation or goal, and are often repeated, until they get impressed on the subconscious mind. It is believed that the average person has up to 70,000 thoughts a day. Also, for most people 80% of these thoughts are negative. It’s also believed that most of these 70,000 thoughts are subconscious thoughts meaning that they are below our conscious level of awareness. Scientifically speaking, these repetitive negative thoughts in the subconscious mind form what are called neural pathways in the brain. If you travel through a forest and always go the same way eventually a pathway will form. The whole forest is still there, but you’re not aware of it. You just continue along on the same old pathway. Affirmations are a way for you to use your conscious thoughts to manipulate the deep seeded thoughts that are ingrained in the subconscious mind. The next time you ask yourself, Affirmations! What Is That!, know that they are a way to harness the power of your conscious mind. Suppose one day you’re walking on your pathway in the forest and you see a group of people having fun in a different direction, off of your pathway. You’re intrigued and want to join them. However, fear and doubt prevent you from doing so. You say things like – I can’t go that way, there might be thorns, snakes, or whatever. Days go by and the intrigue gets harder and harder to resist. You start saying things like – maybe I can go, it won’t be that hard. Then one day you decide or you make a “conscious decision” to give it a go. You start your way over but stop a quarter of the way through. It’s just too difficult to handle. This process continues day after day. Eventually, you progress further and further because a new pathway is forming. Before long, a new pathway has formed and you can go in the new direction easily. Throughout the process of forming a new neural pathway, you will become aware of all the negative thoughts that are in your subconscious mind. That’s because when you start making conscious positive thoughts, you actually become more aware of the negative thoughts that are always threatening to take over. You actually become the observer. It’s an interesting phenomenon, really. It actually proves the old saying “be careful what you wish for because you just might get it all.” This is basically telling you that you create what you think about. When you get on the kick of thinking about something negative it’s almost like a snowball effect happens. You keep adding on more negative things to think about until you’re in a state of depression or despair. Remember when I said that 80% of most people’s thought are negative? Well, it gets even better than that. It’s believed that whatever you are thinking about, 90% gets carried over to the next day’s 70,000 thoughts. So, if you’re thinking negative thoughts, you will cause yourself to think more negative thoughts. This will only make that neural pathway more ingrained in your subconscious mind. Affirmations can change all of that! To affirm means to say something positively. It means to declare firmly and assert something to be true. Affirmations are statements where you claim what you want to be true, is true.